GREENLAND, Tortola, VI – Eighth District candidate on the Virgin Islands Party (VIP) ticket, Mr McLloyd O. Walters has questioned the decision by the National Democratic Party government to take the land used for major activities in East End, including festivals, and put in the hands of FIFA for the construction of a stadium. Mr Walters had the issue of the FIFA stadium construction at the core of his address to constituents last night, June 1, 2015. 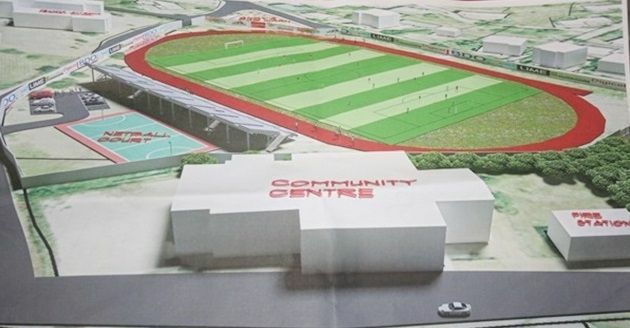 In his view, the stadium should have been constructed on the campus of the H. Lavity Stoutt Community College (HLSCC) in Paraquita Bay as part of the college’s athletics programme and, according to Mr Walters, this was a question residents failed to put to government. “What now becomes of our August Festival? I am told that they are supposed to be leasing some of the lands from one of the families to keep the festival but is this now something that is going to be continued every year, leasing and leasing property?” Mr Walters questioned. Considering the FIFA corruption scandal and arrests of top FIFA officials on the international scene, Mr Walters questioned whether the proposed stadium for the Virgin Islands (VI) would be constructed in a timely manner. He gave reference to a situation in the Cayman Islands where FIFA was involved in the construction of two stadiums there and one took years to be completed. During a consultation with the community regarding the construction of the FIFA stadium at the Festival Grounds in November 2013, it was said that festival activities were going to be held at the Greenland Field. There were two options, the first of which is the Greenland Field while the other is the stadium’s parking lot. Representative for the Eighth District, Hon Marlon A. Penn had said, however, he prefers the idea of having the festival activities at the Greenland Field as opposed to the parking lot. He repeatedly made the statement during a public meeting on October 30, 2013 were they sought the blessings of the communities of East End and Long Look for the construction of the stadium as they eyed substantial funding from the world governing body for football, FIFA. "We are looking potentially for festival to go into the Greenland Field, which I think is the ideal spot for festivals on the field itself where it used to be...Which is really standard in many of the Caribbean countries when they have their festival, they are done on the playing field," Hon Penn had stated. He had recalled Emancipation Festival being held on the Greenland Field for many years. In addition to the proposed locations for the festival activities, Hon Penn had said accommodation would be made available to the EE/LL Festival Committee to hold their meetings and fundraising activities at the stadium. Justifying the potential spinoffs of the construction of the stadium, Hon Penn had said because there will be activities such as football on a regular basis, the festival committee would be in a unique position to capitalise on fundraising opportunities. The man was talking to 5 people and 30 empty chairs. Sir, although I applaud you for your efforts... Marlon all the way! College grounds should build dormitories for students and attract students from other parts of the world. You have to build up a better tertiary education system first before you can even fathom building dorms. His on focus is being shown right now. Check to see what the original plan that Lavity left for the college looks like and you will see all what should have been on that campus. What the hell is this man serious? HLSCC campus is to expand the damn college. If Dawson was doing his job as leader, it would be much further ahead. McLeod needs to go sit the hell down with this crap. UVI has a golf course. UWI has a cricket ground. Many colleges and universities have football fields, athletic tracks and swimming arenas. It is not such a preposterous idea. It could generate greater publicity and enhanced funding for the college. The hillside property can be used for the further expansion of the college, similar to UVI's land use. The golf course, swimming areas, and athletic tracks were all on the plan H. Lavity Stoutt had for the college. There should be public record of it at Town and Country planning. I was unaware of the extent of the late Stoutt's plans to include sports facilities. Thank you. it needs dorms first to house our sister island students at least. This would be a cheaper means of them finding accomodations and also generate additional revenue for the college. Dorms were also included in the plan for HLSCC. Maybe its time for them to complete the campus and bring out the vision the founder left for them to fulfill. What you see there does not begin to show the vision Mr. Stoutt had for this country. Another clown without a script. There should never have been a stadium in the first place. The amount of public loss for private gain is not a trade-off. How many people play soccer? This is a big investment for little return and disrupts a community with traffic and big walls further dividing open space. It is not a good fit and I bet money laundering by FIFA has something to do with it. How much studying did they do about social impact anyway? NDP wants to play with the big boys, but BVI is small territory and doesn't have the space. The Cultural Center needs a be updated. It's time for a modern Cultural Arts Arena with comfortable seating, a nice concession area and modern bathrooms. You are very misguided. Over 700 youth play soccer in the leagues every year. Name another sport here with that level of participation. Over 100 kids practice soccer every Saturday ALL YEAR. Name another sport here with that level of participation. Over 50 boys and girls get to travel year round to major tournaments overseas and are exposed to professional coaches etc. Stop talking what you do not know. The FIFA stadium is a great thing for the entire BVI and will not only be used for soccer. Stop playing politics and look at the bigger picture. I notice under VIP, things will be called good for the small man and the same thing under NDP will be called a rich man scheme. You all need to grow the £$%@ up man. Football, or "Soccer" as you like to call it is played by more people in the world than any other sport, second in terms of numbers is cricket. I am guessing that you think softball or basketball are right up there. This new facility will be wonderful for sport and could be used for the development of football, rugby, field hockey, track & field among other sports. That comment is totally misguided and short sighted. That's the problem with our country people just rub there mouths without check the facts. Football is the No. 1 team sport in the world and must played locally amongst young people. With over 1000 young people participating in BVIFA league annually. Football provides more opportunities for scholarships at universities in the US, Canada and Europe than any other teams sport. You people need to stop being so short sighted and see the big picture. So I guess the FIFA professionals who have been involved with stadiums world wide are jack @$$3$ and we should instead listen to McLeod? Wait until the US exposes the full brunt of FIFA's corruption! an uninformed utterance if ever there was one. Leave Marlon alone he may not have your skills but he tried and he delivered. Can't you see his labor? If you can't I can see it although I'm not in the district he has proven him self as a freshman. So where would cricket be played now as it is clear that cricket as the most crowd when I come to spectators?????? Why this man don't just stay home and spend time with his family. If the chairs could fold up and walk away on their own, they would have done so last night. Dawson takes directives from the board...it is not his ship. the College is run from Manchester....leave dawson in peace. ....was/is a law unto himself. He takes direction /advice from nobody.